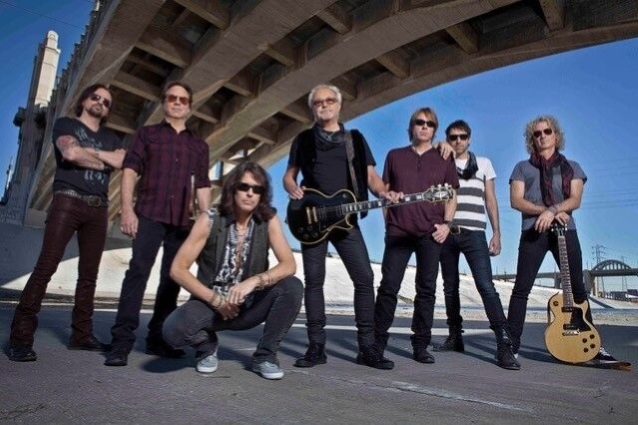 FOREIGNER guitarist Mick Jones has admitted to "Rock Talk With Mitch Lafon" that Lou Gramm's recent announcement that he was retiring from performing as a solo artist caught him by surprise. "It did a bit," Mick said (hear audio below). "But I think [Lou] wants to devote more time to his family; he's got a big family. And I can't say that that's a definite. I still have a feeling that he's gonna be maybe doing more shows. And who knows? It's funny — the music business never seems to be a real cut-and-dried finish to a career. There's usually quite a few years to carry on with farewell concerts." Asked if he thinks FOREIGNER can continue touring well after he retires from performing with the band, Mick said: "That's a good question. But we haven't really made any definite plans, or a master plan, or whatever you call it. As long as I feel good and I can play like I need to… We have a great band with the new guys, and I certainly think they would be capable of carrying it on. Who knows? At this point, I'm living in the present and not thinking about that too much. But in time, obviously, it'll be something we have to talk about." Last year, Gramm participated in FOREIGNER's "Double Vision: Then And Now" concerts, which featured current and original members of the band, including Jones, drummer Dennis Elliott, keyboardist Al Greenwood, bassist Rick Wills and guitarist/saxophonist Ian McDonald.